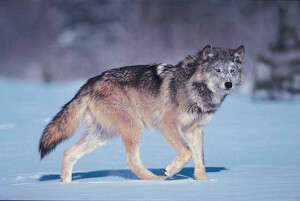 Wolves’ presence and behavior increases wildlife populations despite their killing individual prey. Their predatory role in ecosystems has significant positive impacts on animal and plant communities. For thousands of years their presence in Michigan nature niches fluctuated in relation to plant and animal population abundance. Canada lynx studies found plant populations control top predator populations. The Hudson Bay trapping records show snowshoe hare populations increased despite lynx, wolf, and other predators until the hares over browsed the plants causing hare starvation. When hares died the predators starved. Predation slowed hare population growth that helped maintained healthier communities. When wolves were returned to Yellowstone National Park in 1995, they caused elk and other prey species to roam more. This saved shrubs and trees from being over browsed in valleys along rivers. Shrubs and trees regenerated habitat when protected by wolves. Mice, rabbits, and other herbivores were able to find food where deer and elk had previously devastated wildlife communities by overgrazing. Songbirds moved into areas when vegetation recovered. Beavers found rapid growing aspens provided essential food that allowed their return to streams and rivers. They built dams creating rich floodplain habitat that had been lost and washed away in the absence of wolves. Wolves eat beavers when the opportunity arises but these rodents reproduce more rapidly than predators kill them. Large fires in the Yellowstone region also rejuvenated early succession communities but wolves caused elk and deer to move preventing overgrazing. Beavers created wetland habitats, stabilized stream banks, and reduced soil erosion. Fish populations found healthier streambeds for egg laying. More oxygen in less silted rivers aided fish survival. With increased landscape vegetation that resulted from wolf presence, plant-eating rodents increased and resulted in more predators like hawks, eagles, weasels, foxes, and badgers. Carrion left by wolves allowed bears, ravens, and other animals to provide more food and it improved their health and reproductive success. Increased shrubs provided more berries needed by bears, birds, and many other animals. What inferences can be applied to Michigan ecosystems? No one animal or plant is responsible for all positive or negative changes. It is a community effort but some animals like the wolf start what is called a positive “trophic cascade” in how they change animal movements and cull animal populations with selected animal predation. The wolves even changed the course of rivers. Overgrazed landscape along rivers cut straighter channels when wolves were removed but with the wolf return stream meanders returned. Vegetation recovery along banks reduced erosion causing stream meandering. More pools developed with more fish hiding places. Waterfowl increased. Wolves transformed the landscape to healthier nature niches for plants, mammals, birds, amphibians, insects and a host of native wildlife that had diminished in wolf absence. Human social and economic aspects of wolf presence have been beneficial in the Yellowstone ecosystem but not completely. Ranchers drive cattle into the national forest and leave them unattended to feed. In Michigan, farmers graze animals on their private property and care for their livestock. The national forests are public lands used for watershed flood management, timber harvest, grazing, hunting, hiking, camping, recreation, fishing, and mineral extraction. In short they are all things for all people. This becomes a management challenge when people consider their interests more important than their neighbors and it results in Congressional gridlock. Maintaining healthy ecosystems to provide for future generations of our families requires decisions beyond one group’s personal self-centered interest. There are times when wolf management is important for our neighbors. At present in Michigan, each case is addressed when a problem arises. Legal hunting might one day be appropriate in balance with the multiple uses of our National and State forests in the UP. Decisions should be ecosystem focused for maintaining society’s sustainable needs. Plants and animals have essential roles in ecosystem sustainability that we cannot duplicate. Future generations are as important as our own but decisions frequently place priority only on the present. Natural history questions or topic suggestions can be directed to Ranger Steve (Mueller) at the odybrook@chartermi.net Ody Brook, 13010 Northland Dr, Cedar Springs, MI 49319-8433.